Exercise equipment for outdoor activities opens a new direction in occupations with weights for peo.. 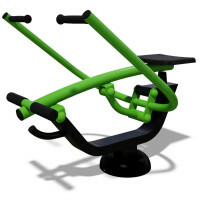 Outdoor exercise equipment reveals a new direction in working out with weights for people of differe.. Trains and develops shoulders, abdominal muscles, bust and back muscles. Fixes posture and improves.. Trains back, buttocks and hip joints. Characteristics:Length: 1000 mmWidth: 653 mmHeight: 743 m..